Floor-standing vs Bookshelf Loudspeakers - Which Is Best? Floor-standing and Bookshelf Speakers - Which Is Right For You? Whether you like it large or small, there is a speaker for you. Loudspeakers have to sound good, but another important consideration is how they fit with your room size and decor. With that in mind, loudspeakers come in two main exterior physical types: Floor-standing and Bookshelf. However, within those two categories, there is a lot of variation in terms of size and shape. From the beginning of Hi-Fidelity stereo sound, floor-standing speakers have been the favored type for serious music listening. What makes floor-standing speakers a preferred option is that they don't need to placed on a table or stand, and are large enough to house multiple speaker drivers, which may include a tweeter for the high frequencies, midrange for dialog and vocals, and woofer for low frequencies. Some floor-standing speakers might also include an additional passive radiator, or front or rear port, that is used to extend low-frequency output. A speaker that includes a port is referred to as having a Bass Reflex design. There are also some floor-standing speakers that also include a built-in powered subwoofer that really extends low-frequency performance. However, floor-standing speakers don't necessarily need to be big and bulky. Another type of floor-standing speaker design that takes a very slim approach is referred to as the "Tall Boy" speaker. This type of speaker design is sometimes used in home theater-in-a-box systems (see example in the photo attached shown at the top of this article). As an additional note, floor-standing speakers (whether traditional or tall boy) are sometimes referred to as tower speakers. One example of a floor-standing speaker is the Fluance XL5F. An example of floor-standing speakers that feature built-in powered subwoofers is the Definitive Technology BP9000 Series. For additional examples, check out our continually updated listing of Best Floor-Standing Speakers. Another common speaker design that is available, is referred to as a Bookshelf speaker. As the name implies, these speakers are more compact than floor-standing speakers, and although some are small enough to fit on a bookshelf, most are actually larger, but can easily sit on a table, placed on a stand, and can even be mounted on a wall. Bookshelf speakers typically have a "box" design, but there are some that nothing more than small cubes (Bose), and some are spherical (Orb Audio, Anthony Gallo Acoustics). However, due to their size, although some bookshelf speakers actually have a better low-frequency response than you might expect, for serious music listening and movie viewing, it is best to pair bookshelf speakers with a separate subwoofer for access to those lower bass frequencies. Bookshelf speakers are a better match when integrated into a home theater surround sound setup. In this case, the bookshelf speakers are used for the front, surround, and height channels, while a subwoofer is used strictly for the bass. One example of a bookshelf speaker is the SVS Prime Elevation Speaker. Check out more examples of Bookshelf speakers. Also, there is a variation of the Bookshelf that is referred to as a center channel speaker. This type of speaker is used most commonly in a home theater speaker setup. A center channel speaker typically has a horizontal design. In other words, while floor-standing and standard bookshelf speakers house speakers in a vertical arrangement (usually with the tweeter on the top, and the midrange/woofer below the tweeter), a center channel speaker often times has two midrange/woofers on its left and right side, and a tweeter in the middle. This horizontal design enables the speaker to be placed above or below a TV or video projection screen, either on a shelf or mounted on a wall. Check out examples of Center Channel Speakers. Another type of speaker form factor that is specially designed for home theater use, is referred to as an LCR speaker. LCR refers to Left, Center, Right. What this means, is that inside a single horizontal cabinet, an LCR speaker houses speakers for the left, center, and right channels for a home theater setup. Because of their wide horizontal design, LCR speakers outwardly look like a sound bar and are sometimes referred to as passive sound bars. The reason for the designation as a passive soundbar is that unlike "real" soundbars, an LCR speaker requires connection to external amplifiers or a home theater receiver in order to produce sound. However, exclusive of the way it has to be connected, its physical design still has some of the advantages of a sound bar, as you don't need separate left/right bookshelf and center channel speakers - their functions are encased in an all-in-one space-saving cabinet. 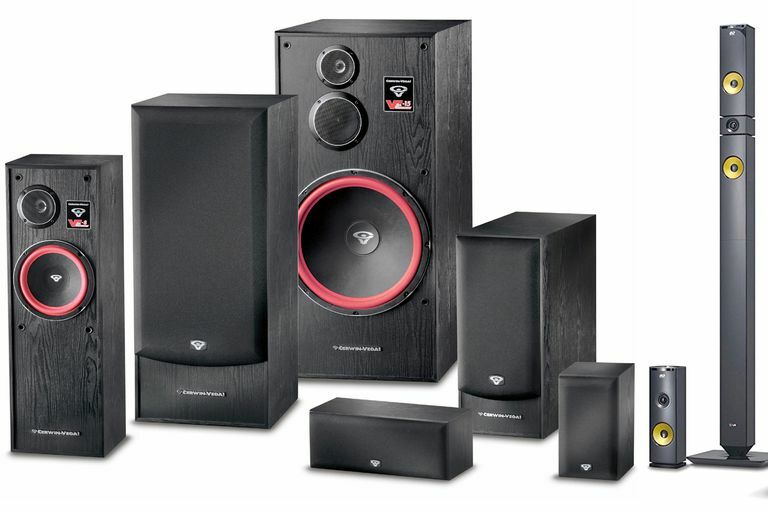 Two examples of free-standing LCR speakers are the Paradigm Millenia 20 and the KEF HTF7003. So, Which Type Of Speaker Design Is Best? Whether you need to choose a floor-standing, Bookshelf, or LCR Speaker for your home audio/home theater setup is really up to you, but here are some things to take into consideration. If you are interested in dedicated serious stereo music listening, consider floor-standing speakers, as they typically provide a full range sound that is a good match for music listening. If you are interested in serious music listening but don't have space for floor-standing speakers, then consider a set of bookshelf speakers for the left and right channels and a subwoofer for the lower frequencies. For a home theater setup, you have the option using floor-standing or bookshelf speakers for the front left and right channels, but consider bookshelf speakers for the surround channels - and, of course, consider a compact center channel speaker that can be placed above or below a TV or video projection screen. However, even if you are using floor-standing speakers for the front left and right channels, it is still advisable to add a subwoofer for the extreme low frequencies that are common in movies. However, one exception to this rule is if you have a floor-standing left and right channel speakers that have their own built-in powered subwoofers. No matter what type of speaker (or speakers) you think you need or desire, before making a final purchase decision, you should take advantage of any listening opportunities, starting with friends and neighbors that have stereo and/or home theater speaker setups, as well as going to a dealer that has dedicated sound room for demonstrating different types of speaker. Also, when you venture out for listening tests, take some of your own CDs, DVDs, Blu-ray Discs, and even music on your smartphone so you can hear what the speakers sound like with your favorite music or movies. Of course, the final test comes when you get your speakers home and hear them in your room environment - and although you should be satisfied with the results, do make sure you inquire about any product return privileges in case you are not happy with what you hear.